It is the application of the engineering sciences to the investigation of failures or performance problems and is Highly specialized field of engineering practice. It Requires engineering expertise and knowledge of legal procedures. 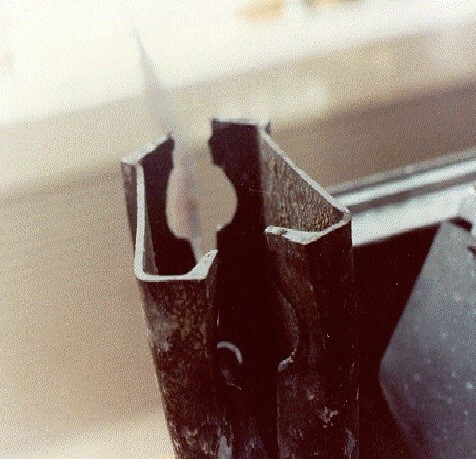 From an engineering perspective, forensic engineering deals with the investigation and reconstruction of failures. From a legal perspective, forensic engineering is a fact-finding mission to learn the most probable cause or causes of a failure. •To determine the causes of failure. •To compare statements by witnesses or injured parties with physical evidence. •To ascertain whether an illegal or improper activity was causative. •To assess damage to materials, products or structures and evaluate repair estimate. 1.Structural Distress: an impairment of the strength or load response of a structure which may limit its use as intended. 2.Structural Failure: the reduction of the capability of a structural system or component to such a degree that it cannot safely serve its intended purpose. 3.Structural Collapse: Gross movement of major members or a significant portion of a structural system manifested by the creation of rubble from breakage of the members themselves and elements supported by themselves. Gerald Leonards (1992) defines “failure” as an unacceptable difference between expected and observed performance. This definition can be used to describe a catastrophic failures as well as minor failures such as roof leaks.The ASCE Technical Council on Forensic Engineering has adopted the above definition provided by Gerald Leonards. •Establishing a preliminary objective and scope of work,Checking on conflicts in interest, Executing a contract agreement, and Establishing an investigative plan. 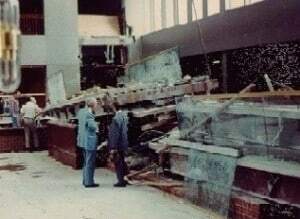 The Hyatt Regency Walkway Collapse was the worst structural failure in the history of the United States.111 people were killed and more than 200 were injured. The Hyatt Regency hotel opened in Kansas City, Missouri, USA in 1980. It comprised a 40-story tower, an atrium, and a function block, housing all of the hotel’s services. Three walkways suspended from the atrium’s ceiling by six 32-mm-diameter tension rods each spanned the 37-m distance between the tower and the function block. The 3rd and 4th floor walkways hung from the ceiling. The 2nd floor walkway was suspended from the beams of the 4th floor walkway, directly below the 4th floor walkway. On the July 17, 1981, around 1500-2000 people occupied the atrium floor and the suspended walkways to see a dance competition. A loud crack echoed throughout the building and connections supporting the ceiling rods that held up the 2nd and 4th floor walkways across the atrium failed. The 4th floor walkway collapsed onto the 2nd floor walkway and then both walkways collapsed onto the crowded 1st floor atrium. 1.Walkways buckled from “harmonic vibration” set up by people swaying or dancing at the same times. This wave like motion generated violent stress and caused vibration failure of the structure. 2.Collapse due to inadequate design of structure. From the photographic evidence it was observed that there were no failure signs on the walkway section, indicating that the collapse was not caused by inadequate design of the section of the walkway. The photograph had provided significant proof to show that the walkway collapse was most likely caused by connection failure. 1.The original design of the rod hanger connection would have supported 90 kN, only 60% of the 151 kN required by the Kansas City building code. This showed that the design of the connection was inadequate. 2.As-built, however, the connection only supported 30% of the minimum load which explains why the walkways collapsed well below maximum load. The National Bureau of Standards (NBS) discovered that the cause of this collapse was quite simple: the rod hanger pulled through the box beam causing the connection supporting the 4th floor walkway to fail.